Our rector, Bingham Powell, has served St. Mary's since June 2007, first as curate in charge of children, youth, and family ministries, then as priest-in-charge (2010-2012), and now as rector. Bingham graduated from Wake Forest University in 2003 (BA), Virginia Theological Seminary (M.Div.) in 2007, and is currently working on his doctor of ministry degree from Virginia Theological Seminary with an anticipated graduation in 2021. Bingham loves to share the Good News of God's love whether through preaching, storytelling, or serving Christ in his neighbor. Pilgrimage has been a huge part of his spiritual growth, and he has embarked on several pilgrimages to the United Kingdom and the Holy Land. In his spare time, Bingham enjoys spending time with his family and running. Along with his ministry at St. Mary's, Bingham has served the Diocese in many ways over the years, including the Youth Ministries Team, Diocesan Council, Convention Planning Committee, Clergy Conference Planning Committee, and the Communications Task Force, among others. He is currently Dean of Central Convocation. An Oregonian by birth, Bingham has spent many years in North Carolina and Virginia, so you might hear an occasional "y'all" slip out from time to time. The Rev. Christine Marie began as our Small Group Ministry Developer in December 2017. Christine helps support leaders of existing small groups with training on leadership and group development, and she helps launch new small groups, training new ministry leaders to take on new small groups. This is a one-quarter time position. Christine has extensive experience in leadership training and small group development. As a priest, she serves at each English-language service about once per month. Christine has been a part of St. Mary’s for several years, celebrating at the 9:30 AM and Circle services and helping support some ECW activities. We are happy to welcome Christine into this expanded role at St. Mary’s. Nancy Crawford was born in Guam, the daughter of a career Navy dentist. She is a cradle Episcopalian on her mother’s side and has been an active church goer since childhood. She received her bachelor’s degree in Elementary Education from University of Louisiana-Monroe, but worked in the fields of mortgage banking, automation, and human resources. She became a member of the St. Mary’s staff in 2000, first as the administrative assistant and then as the financial assistant. Nancy was named parish administrator in March 2010, and retired June 2012. Nancy’s lay ministry in the church was varied throughout her life, serving in many key leadership positions. In 2006 she was ordained to the diaconate, which allowed her role in the church to change to one that includes more guidance and sharing of responsibilities. Beyond St. Mary's, she has served the Diocese and wider church in many ways. She was a member of the search committee to find our current bishop. She has served on Diocesan Council. She has served two terms as Episcopal Church Women president for the diocese, and one term as president of the national ECW board. Tom English was ordained a Deacon in the Episcopal Church in 1999. 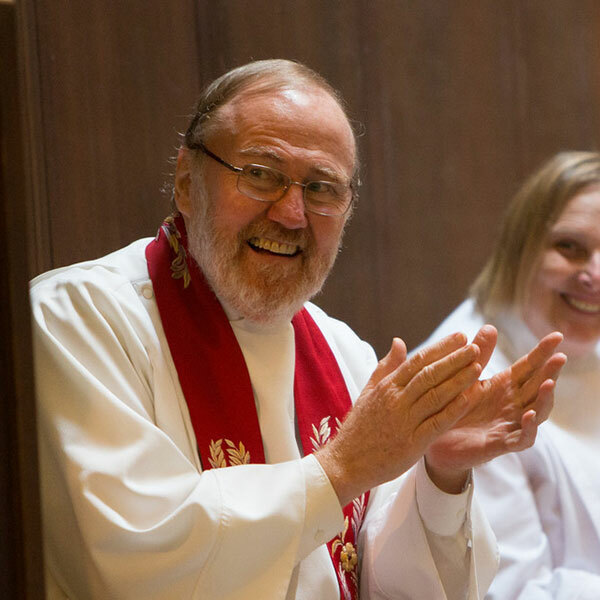 He has served at St. Mary’s Episcopal Church in Eugene, Oregon since. His social ministry has been to the criminal justice system and all whom it serves: inmates, victims, families, corrections staff, and communities. He received a Master’s degree in corrections from the University of Oregon in 1972, directed programs for female and male adolescent offenders, served as consultant to the U.S, Department of Justice for 35 years and has served as a volunteer chaplain at the Lane County Jail and the Oregon Dept. of Corrections for 17 years. He currently is co-chair of the Prison Ministry Commission of the Episcopal Diocese of Oregon and directs St. Mary’s Jail and Prison Ministries. Tom is well informed on criminal justice reform issues serving on the Lane County Public Safety Coordinating Council and as Board member of Sponsor’s Inc., a nationally recognized model re-entry program offenders returning to communities. Deacon Tom is dedicated to the notion that people can and do change and that a fair, humane and effective criminal justice system is essential to Christian theology and to the creation of safe and healthy communities. The Reverend Theodore A. Berktold (Father Ted) was the rector at St. Mary’s from 1982 until his retirement in 2010. Our membership, our organizational strength, and our financial base grew under his leadership. At the time of his retirement, the Vestry bestowed upon him the title of Rector Emeritus. Father Ted has made many professional contributions at the diocesan and national levels, including long range planning, Ministry in Higher Education, and stewardship. He has served as deputy to two general conventions, Dean of the Convocation, and member of Diocesan Council and Standing Committee. He is Chaplain of the South Willamette Valley Chapter of the Order of St. Luke. Maria, who started at St. Mary's in January 2016, is the latest in a long line of exceptional organists. Maria trained at the Russian Academy of Music, the Moscow Tchaikovsky Conservatory, and at the University of Oregon under Barbara Baird and has experience working in Episcopal, Roman Catholic, Presbyterian, and Methodist congregations along with several non-parochial positions. Prior to coming to St. Mary's, she served as Director of Music Ministry at the Episcopal Church of the Good Samaritan, Corvallis, Oregon. Judy began working at St. Mary's part-time in 2015 as our Program Support Team Assistant. Her primary job was to create our weekly bulletins and to help with other tasks. In October 2017, Judy transitioned into a new, larger role as Buildings and Operations Manager. Now, in addition to the weekly bulletins, she is in charge of the church office, keeping the parish calendar, and scheduling the building for St Mary’s and community users. She is also in charge of office supplies and equipment, oversees the Office Assistants, and works with our new Facilities and Grounds Maintenance Manager to ensure that our building is functional for our many ministries. Louise was previously our Office and Building Manager for twelve years. During that time, communications at the parish grew significantly. As we shifted staffing in 2017, Louise's responsibilities began to focus more thoroughly on communication: editing and producing the Bellringer, on-going maintenance of our website, St. Mary’s presence on social media, weekly email announcements, and helping St. Mary's ministries tell their stories. She is also helping the rector implement our programmatic ministry goals and taking on the staff coordination role for events such as An Evening at St. Mary's/Family Fun Night, Lessons and Carols, the Annual Picnic, and much more. Lana Johnson is a native Oregonian and a cradle Episcopalian. She and her husband, Shane, were actively involved at St. Mary’s for many years before she was welcomed to the staff as Finance and Records Manager. She has a Masters of Business degree with a finance specialty, and has more than 20 years of experience as a bookkeeper. She ran a family business for 15 years, negotiating agreements between family members, making sound investment decisions, and managing for the good of the company while looking out for all the family owners’ interests as well. St. Mary’s has many of the same challenges (remaining professional while remembering that everybody has a valuable opinion) that she experienced in the for-profit world. If you have a finance question, please ask Lana, but don’t stop there. She is interested in all sorts of things, and can usually help solve any problems that come up. Sue Ann joined St. Mary's staff in 2013. She helps lead our Sunday School program, working with teachers, students, and families of our children, focusing primarily on Pre-k through Elementary school. She also helps coordinate other activities such as the Christmas Pagaent, Vacation Bible Camp, and the Family Fun Nights. As a retired teacher from the Eugene School District Sue Ann brings 35 years of educational background to the program being offered at Saint Mary’s. Her expertise in curriculum development and leadership in the 4j district support the skills she brings to reinforce the wonderful volunteers we have leading our youth. Along with her part time responsibilities at St. Mary’s, Sue Ann is also currently working at the University of Oregon supervising students that are in the masters program, as well as being the owner and CFO of her family wine business. Carolyn Williams joined our staff in this new position in December 2017. Carolyn partners with Sue Ann to help lead our education and fellowship ministries for children and youth, focusing primarily on youth in middle and and high school. Along with her extensive professional experience as an educator, Carolyn grew up at St. Mary’s. Having been a Sunday school student, teacher, and parent here at St. Mary’s, Carolyn knows this ministry from many different angles and brings that wealth of experience to this position. Glenda has been the nursery caregiver since 2007 and loves the children in her care. Every Sunday at the 9:30 AM service, Glenda and her wonderful and caring volunteers are there to assist you. They have fun toys, crafts, music, stories, and cuddles for those wanting it. Glenda also staffs the "Evening at St. Mary's" functions and some other fellowship and education events, so you can come and enjoy the events while your kids have fun too. Glenda is always open for your suggestions and welcomes you to come down and check out our great nursery. The Rev. 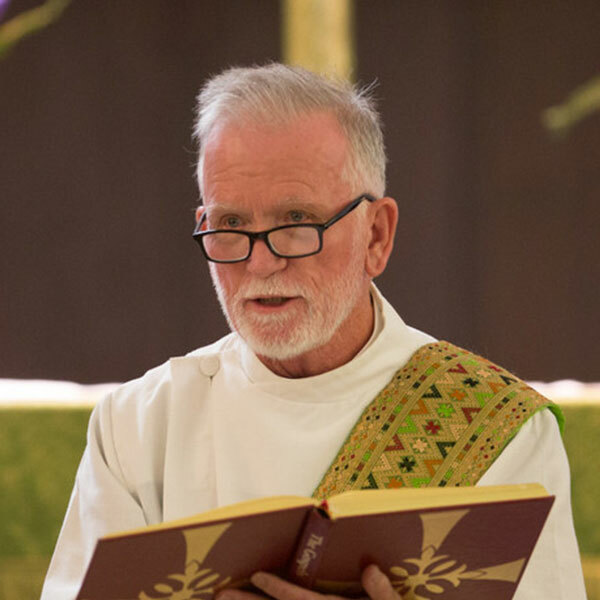 Doug Hale is the interim chaplain of the Episcopal Campus Ministry, available to serve students at the University of Oregon, Lane Community College, and Northwest Christian University. Episcopal Campus Ministry is a joint ministry with the Diocese and other local Episcopal churches. Doug+ has 25 years of experience in parish and outreach ministries; was a board member of the University Christian Fellowship, Eastern Oregon University in La Grande; lists teaching (including classes on Biblical Greek) as one of his ministry specialties; and, holds a Master's in Church History, a BS in Psychology, and an Master of Divinity in pastoral ministry. Tom Trent, director of St. Mary’s Liturgical Choir, is a composer, tenor soloist, musicologist, instrumentalist, computer whiz, and ham radio operator. He received his doctorate in composition from the University of Oregon. Several of his compositions have been performed at the Oregon Bach Festival. Linnae joined St. Mary's staff in September 2017. She comes from Salem where she worked in the Salem-Keizer School District teaching general music and middle school band. Her main instrument is the alto saxophone. She lives with her husband and daughter and enjoys taking care of their garden, cat, dogs, chickens, ducks, and the occasional weasel. The Cherub Choir meets during Sunday school and sings the first Sunday of the month. All St. Mary’s children ages pre-K through second grade are already in Cherub Choir! The Joyful Noise Choir was added to Linnae's plate in July 2018. Joyful Noise Choir is for children and youth 3rd grade and up; although parents of motivated 2nd graders are welcome to contact Linnae to inquire about joining. After years of being the soprano section leader for the Liturgical Choir at the 11 AM service, Jessica joined the Children and Youth Choirs team in September 2017. Jessica studied voice and pedagogy in graduate school at the Longy School of Music in Cambridge, Massachusetts. Her main instrument is voice, but she also plays recorder, piano, and a little ukulele. Jessie performs with several groups in and around Eugene, including Vox Resonant and the St Paul’s Chamber Singers in Salem. In her spare time, she dances West Coast Swing and trains for triathlons! The Youth Choir (grades 8 and up) sings at the 9:30 service on the third Sunday of every month. Facilities and Grounds Maintenance is a new position created in 2017. Tom will help keep our building in good repair, doing some work himself, inviting other handy parishioners to get involved, and calling the right expert when needed. He will be working about 15 hours per week. Tom is a long-time member of St. Mary’s with vast experience in many aspects of St. Mary’s life, including volunteering on many building projects over the years.